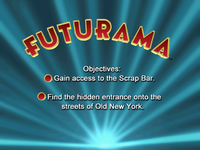 Futurama is a game based on the hit show of the same name, written by the show's writers and starring most of its cast (a few, such as Amy and Hermes, either aren't present or aren't voiced). Produced during Season 4 but not released until after the show's initial cancellation, a compilation of the cutscenes and some gameplay was presented as a bonus on the Beast With A Billion Backs DVD six years later. 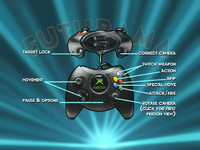 A debugging string is present in the default.xbe file (C:\Code\Futurama\Futurama\Build\XBoxMaster\Futurama.exe). sal.ucf is a model of Sal. 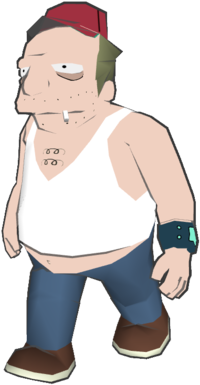 Although he makes an appearance in the FMV cutscenes, he doesn't appear in-game, so this model goes unused. Likewise, although Larry appears in the FMV cutscenes, he doesn't appear in-game so his model, larry.ucf, is also unused. Bender 2br25-4.vag Another gun? This day just gets better and better! Suggests that Bender was at some point going to have access to guns. 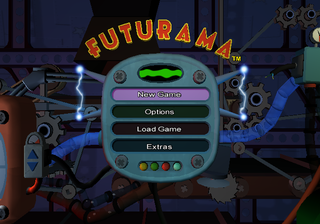 This is supported by the game's cover art, which shows some of Bender's fingers converted into a gun. sal0001.vag And I guess now maybe, I can get to know the real Lucy Liu. Placeholder dialogue taken from the Futurama episode "I Dated a Robot". Destructor speech-iwill.vag I will destroy you! Placeholder dialogue taken from the Futurama episode "Raging Bender". Two robots stdial1w_temp-3.vag Robot 1: So how was your power down time? Robot 2: Great. But you know, toward the end of it, I was itching to get back to work. Audio from a cutscene in the Uptown level, but the first robot uses a placeholder voice. Two robots stdial2w_temp-3.vag Robot 1: Does this casing make me look fat? Robot 2: Stop asking me that. Audio from a cutscene in the Red Light District level, but the first robot uses a placeholder voice and the second robot's line appears to use a different recording. Unknown lev 5 st dial#1-1.vag Character 1: I love you. Character 2: Aw come on, why do you keep doin' this to me? Character 1: I'm just telling you how I feel. What's wrong with that? Character 2: We broke up, Frank. Dialogue between two unknown characters. 01 - front-end-shorted.vag A different version of the title screen music. 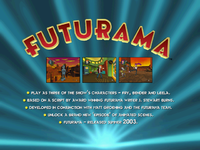 Although this version is shorter than the used theme, its opening is extended. endoflevel_remix.vag Filename suggests it would have been used at the level-end screen. placeholder2.vag A three second placeholder music loop. theme22.vag The Futurama opening theme. 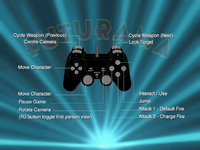 Check if there's graphics for the Z button, L and R triggers, and left and right pads as well. 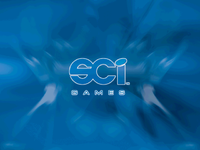 Button graphics for the planned GameCube version, which was cancelled at the last minute. cash_icon.nif, goldbar_icon.nif and ruby_icon.nif each contain the same placeholder image. 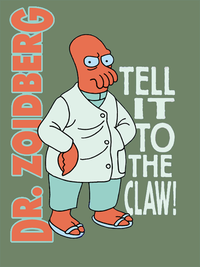 leaveme.nif is a picture of Dr. Zoidberg. 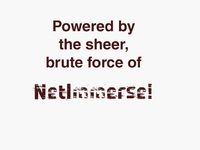 testscreen.nif is a test screen. Leftover screens from the game's demo releases. 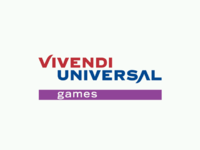 Unused screens for SCi Games, Vivendi Universal Games and NetImmerse. 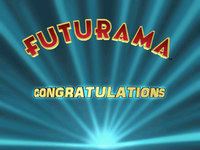 A giant Easter Egg is hidden in the Planet Express level surrounded by rapidly moving yellow dots. It is located behind a wall of the corridor between the employee lounge and the conference room (2nd floor). The egg can be viewed by standing in a corner of the corridor then moving the camera up and then sideways into the hidden area. The egg produces a glow which appears to start from inside its center. The font tool takes as input a tga file containing the images for all the characters that this font will contain ( referred to as 'glyphs' ). It also takes a file that contains the characters (and ascii literals) so it knows which glyph to connect to which character in a string. It'll be obvious in a minute. I hope. It also takes a couple of command line parameters, some are optional. The default is "output" and in the current directory. tolerance value of -2 or -3 to crop them a little tighter. intersecting letters in another row. The character list file tells the font system what characters / glpyhs to connect to, or in other words, how to make sense of the input tga file. .. and so on. Anything after and including the '\\' is treated as a comment and ignored. 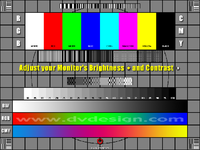 This page was last modified on 16 March 2019, at 13:58.